Heat the oil in a medium saucepan over medium-high heat until hot but not smoking. Add the rice and cook, stirring often, until it becomes milky white, crackles and feels heavier as you stir it, about 3 minutes. Make room in the center of the pan, add the onion and garlic and cook for 2 to 3 minutes, stirring and mixing with the rice, until the onion begins to soften. Add the chicken broth, cream of coconut and salt and stir well. Raise the heat to high, bring to a rolling boil, stir, cover and reduce the heat to the lowest setting. Simmer 12 to 15 minutes, until most of the liquid has been absorbed but there is still some moisture in the pan. The rice should be cooked and tender; if it is not, but all the liquid has been absorbed, add 2 tablespoons of water, cover again, and cook for a couple more minutes. Remove from the heat and let the rice rest, covered, for 5 minutes. 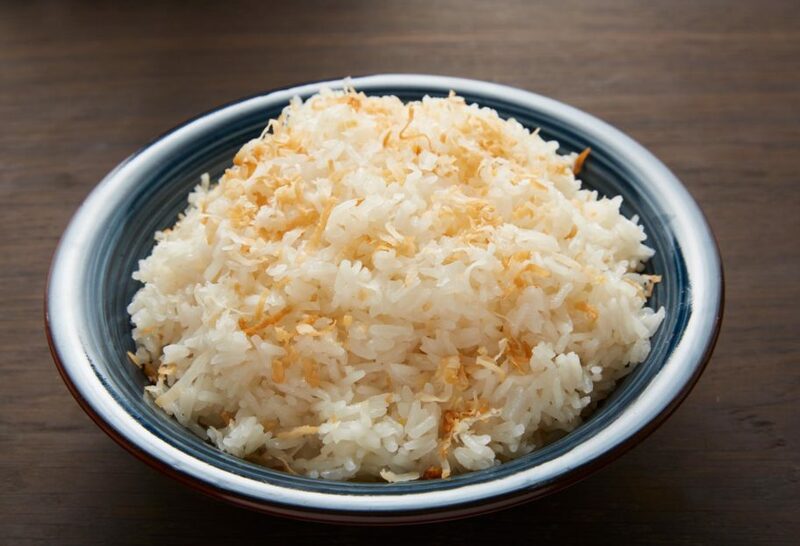 Fluff the rice with a fork, garnish with salted and toasted coconut flakes, and serve. Hi Pati…that sounds awesome….we’re definitely going to try that as a side dish when we have our salmon. Thank you. Awesome! Enjoy your meal, Rick. Hi Pati! I love your show and the great recipes you prepare and share. Is the coconut ingredient the sweetened version like used in pina coladas, or coconut milk often used in Thai recipes? Thank you for the clarification! It’s not coconut milk, but coconut cream, like what you use in a pina colada. Enjoy the rice, Debi!